Let's use the power of the written word to show our Thankfulness this season. We all have so much to be grateful for. Let's tell one another how much we love them. Head here for more details on how to take part. 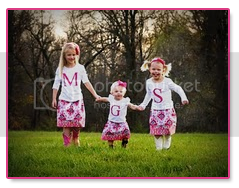 This week I wanted to take a few minutes to remind my three sisters of how thankful I am for them. Because of them, my life growing up in a sometimes challenging and tough world, was so much easier. I never felt alone or not a part of something. I never worried too much about fitting in with certain groups because at the end of the day, we were our OWN group. From the left, Adie 28, Maggie 23, Me 31, and Haley, Adie’s twin, is also 28, obviously. We are all different, but also very much alike. For example, Haley prefers a crochet hat, which is actually a doll dress, while Adie goes for a more classic look of a baseball cap five sizes too big. Then there’s me, all about the sunglasses, and white socks pulled up really high. Interesting. And Maggie, well she wasn’t born yet. Sorry Mags. But you were, by far, the cutest. Here is our family, the Viefhaus’ family back in 2003. From the left…. Maggie, Haley, Mom, Dad, Adie and I.
I am so thankful for three sisters that all understand me more than any friend could ever begin to. I am thankful that we all share an addiction to sarcasm and happily embrace each other’s crazy sense of humor. I am thankful to have never had the feeling that I had to try to be anything but myself growing up. I knew they would always love me for who I was. They remind me why I shouldn’t wear high heels. And kindly do wear high heels to make me feel shorter. They tell me when I’m wrong without worrying about hurting my feelings. And they are the first people in my life to compliment and encourage me. Always making me feel good. Four sisters is rare. But four sisters that all truly are each other’s best friends is even more rare. I am so thankful for the journey we have taken together. Our pasts, spent making so many tremendous memories, is something sacred that no one else in the entire world can share with us. We are, if you will, a Midwest version of the Kardashian sisters, without all the red carpet glam. Just our simple lives, filled with laughter, love and lots o’ babies. I find that some people feel the need to travel the world in search of happiness and the meaning of life. But after time, they realize that what truly makes them happy, was right in front of them all along. Home is where the heart is and I am thankful that I had such an amazing family that reassured this to me. Thanks to my sisters, and my entire family, I never felt the desire to search for anything in life. I have always realized that everything I have ever needed to bring me joy is right where it’s been all along. I am so thankful for you Adie, Haley and Maggie. What a beautiful relationship you have with your amazing sisters. Your photographs are beautiful too. It is just plain wrong to have so many pretty people in one family! You have beautiful sisters, and I love that you all are so close!! I am the eldest of 3 girls. I love my sisters so very much too. I am thankful we all love each other and get along.